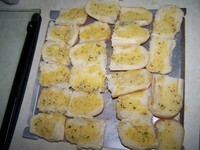 Here’s a cheap and easy way to do garlic bread ("red-neck garlic bread", as Hubs so lovingly calls it). I serve this nearly every time we do Italian, and my family loves it! 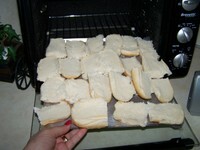 Put them in the oven (I use my toaster oven) and get them nice and toasted. While they’re toasting, melt some butter or margarine and stir in either garlic powder or (our favorite) dry ranch dressing mix. When the bread comes out of the oven, spread the butter mixture over it. Voila! Garlic bread! Want to share your helpful tip with Bloggityville? Leave a link below. First-timers, please read through the guidelines here before posting. And who doesn’t love garlic bread? Thanks for another week. Fun! I can’t wait to read all of them! I can see myself getting seriously addicted to this. We do this with burger buns since an 8 pack lasts a couple a pretty long time. I am going to try the ranch dressing mix-yum! Mmmm, yummy!! I spread it on toast in a pinch ;). Sounds great! I’m going to have to try it with Ranch, we always do garlic. Mmm. I’ve never tried it with ranch dressing mix mixed in. Sounds yummy! Love me some garlic bread! Great idea…thanks. I just posted my first Works for me Wednesday, but forgot to put a description. Sorry! It is a teacher gift idea (I didn’t see the delete link or I would have done so). Me too! Sorry, I posted twice to get the idea in there. I’ll do better next week…promise! What a great idea! I love that you can make as many or as few as you want! I have no problem eating an entire loaf of garlic bread by myself, but perhaps it would be wise to use your idea and save myself a few calories! This garlic bread is something I grew up on. My mom used hamburger buns or hot dog buns, with just butter and garlic salt. In the oven, under the broiler for 2-3 min. Simple, easy, fast and Yummy! Good idea. We’ve used leftover buns for cinnamon toast as well. I’ve never tried the Ranch Dressing version, but it sounds SO YUMMY! My DH complains that I use too much garlic when I cook. I LOVE GARLIC, but I love ranch dressing, too. Thanks for the tip! On a shallow level, your nails always look great in your pictures. I’ve done the same thing using hamburger buns, but hotdog buns are better for kid-sized hands. 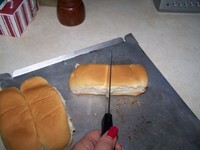 I grew up eating french bread like this… didn’t know it was the redneck version! That made me laugh! Might have to try this, though not with Italian food. Being a NY Italian, there are some things that I just won’t mix! Like cottage cheese in Lasanga, and ranch dressing with anything Italian. When I moved from NY, to go to college in the mid-west I freaked when I saw someone dip there pizza in ranch dressing. Then again, I went three years vowing not to try biscuits and gravy (to me gravy was the brown stuff you put over potatoes) and when I finally did try it, I LOVED it! This is exactly how I do garlic bread at our house. I’ve never tried the ranch flavoring though. I think I’ll try that on our next Italian night. My mouth is watering already. This was my first time participating. Thanks for hosting such a fun and informative event! At our house we love to make garlic bread out of hot dog buns. We might have to try it though with the ranch dressing twist. we have made our garlic bread like this and we love it! Thanks for the Works for Me Wednesday, it is my favorite blog! We’ve done this before but for some reason I thought we were the only ones : )- The ranch is a nice idea though! Is there another way to find the links to WWFM. I am trying to go back through them and find something! Thanks in advance! yep, we did redneck garlic bread too. my fave was when mom would do butter and poppy seeds. yum! We tried the bread tonight and we (kids, too!) loved it! SO EASY! THANK YOU! !